You can integrate with a a custom layout or meet specific requirements. For instance, you show variants in a list and want a ‘notify me’ link on multiple rows. Any element, including <button> or <a> elements can be used by including the attribute id="BIS_trigger". A link works just as well. You can specify which variant is the default selection in the sign up form by including a data-variant-id attribute on the link or button. where 12345678 is replaced with an actual variant id. 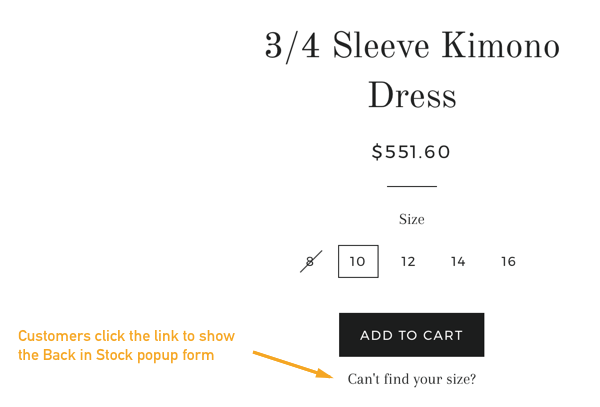 For the majority of layouts you will only want the button to appear when the customer selects a sold out item. If your product catalog only includes single variant products you can use some simple Liquid templating logic to only include the button when the product is sold out. 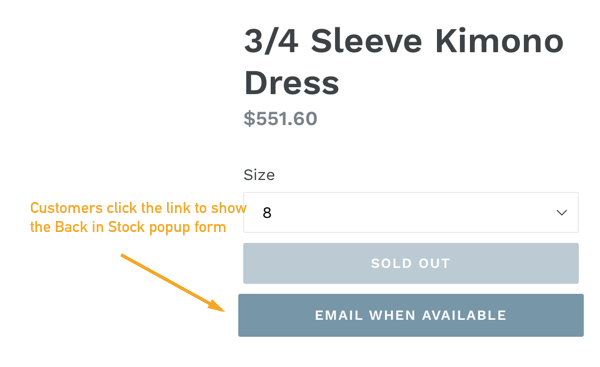 If you your catalog includes multi-variant products (for example, a product with size Small and Large) relying on product.available is suboptimal: the button won’t appear unless all variants are sold out. Instead the recommended solution is to include the button in the template and hide it unless a sold out variant is selected. The following code is an example to demonstrate how to show the link. We include our code at the bottom of the existing selectCallback() function. It won’t work if you simply paste it into your template. We use jQuery to keep the code example short. Some themes use ‘swatches’ to display variant options. These often disable unavailable options and prevent customers from selecting sold out variant. Since customers can’t click to select a sold out variant the code discussed above to toggle the custom link won’t work. For these types of layouts we recommend setting up a link in product page as a secondary call to action. It can appear after the ‘Add to cart’ button and only appears if at least one variant is sold out. This solution can often be configured by Back in Stock support without the need to edit your product template. Please get in touch to find our more. 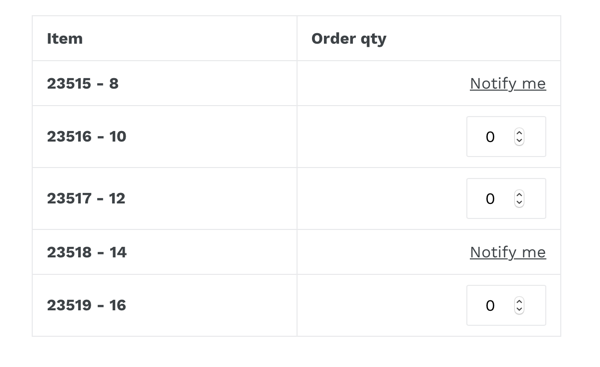 When product page layouts display variants in a list you might like to include a link for each sold out variant. Include the data-variant-id on the element to ensure the correct variant is selected for the customer. We currently can only support using Back in Stock on Shopify stores pages. We are looking to add support for Wordpress sites using the Shopify Buy Button. If you’re interested in doing this please get in touch.